[London: March 2017] On 15th March 2017, between 2pm and 8pm, Ballymore will release their Nature Range apartments at Embassy Gardens. This release will comprise 35 new suites, 1 and 2 bed apartments, with prices starting from £705,000. 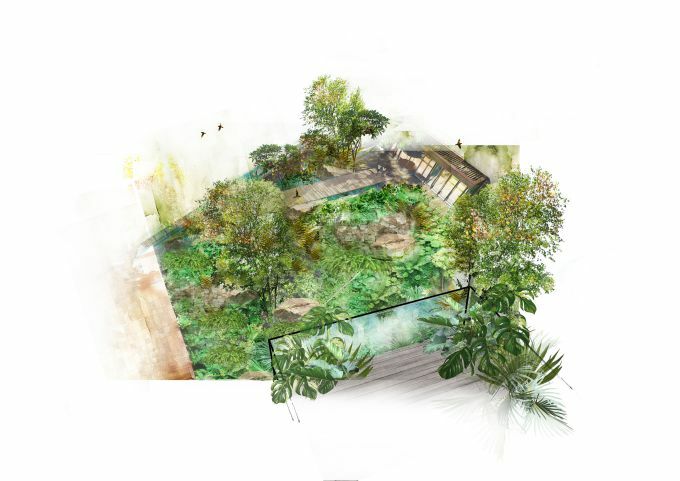 All of the apartments will have views across the garden squares, ravine - a place reminiscent of a secret garden of childhood imagination, filled with foxgloves, ferns, craggy rocks and trickling water -or new linear park - a new green walkway from Vauxhall to Battersea Park. Health and wellness is central to the Embassy Gardens ethos with the homes designed to provide a tranquil and relaxing living environment and resident amenities and open spaces designed to promote a sense of wellbeing. All areas have been a beautifully landscaped with wildflowers and foliage creating a place of respite and a space to relax or to meet your neighbours, in the shade of mature trees or dipping your toes into the cool waters of the pond. From the plank-decked bridge floating above the fauna, impressive collection of public artworks to the sunken lawns providing space for sports and relaxation, every square foot and every time of day is thought through. Huw Morgan, Ballymore’s naturescape designer will be present on the day to talk to visitors about the landscapes that have influenced the landscaping of Embassy Gardens’ nature routes. The event itself will have a floral theme to celebrate the launch of the Nature Range. For those with a sweet tooth there will be a pop up bakery by Lily Vanilli in the Marketing Suite serving baked goodies inspired by nature and flowers, alongside this there will be a vintage flower cart filled with beautiful, fresh and seasonal wild flowers. In addition to providing a beautiful installation for the day, potential buyers will be able to take away a bunch of flowers when they leave. Embassy Gardens is a landmark development set within the Nine Elms on the South Bank regeneration area. The apartments are only a 10 minute walk from Vauxhall Station making transport and commuting easy, connections that will be further improved when the northern line opens two new stations at Nine Elms and Battersea Power Station. The development will provide nearly 2,000 new homes for Londoners when finished and the first phase of the development is already complete and occupied. All Embassy Gardens residents are members of the EG:LE club, an exclusive residents-only private members club which raises the bar on residential development amenities in London. The completed facilities include a private gym, yoga studio, therapy room, traditional library, lounge area and business suite. In addition, the architecturally stunning Sky Pool and sky deck at the top of two of the buildings currently under construction will incorporate a spa, summer bar and the Orangery, which will bring the relaxed feeling of the Mediterranean to central London, allowing residents to relax in a private space which brings the outside in. Embassy Gardens is a landmark development, establishing a totally new community within central London, will see the creation of nearly 2,000 new homes, stunning landscaped gardens, a riverfront walk threading between Embassy Gardens to Battersea Park and vibrant new bars and restaurants providing a variety of al fresco spaces and 130,000 ft² of shopping space. Phase two is being delivered by EcoWorld Ballymore with phase one delivered by Ballymore Group.